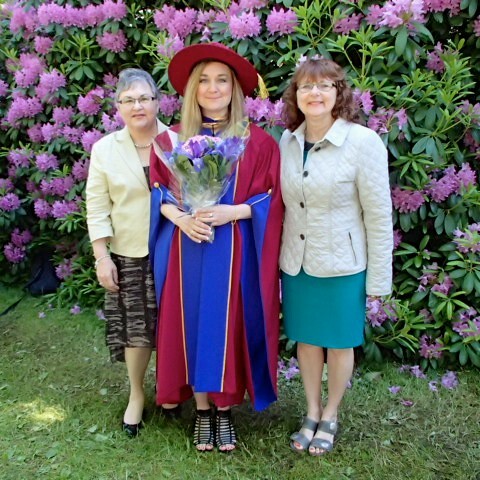 Last Wednesday, I attended my fourth – and final – university convocation as a graduate1, receiving my hard earned MBA2. 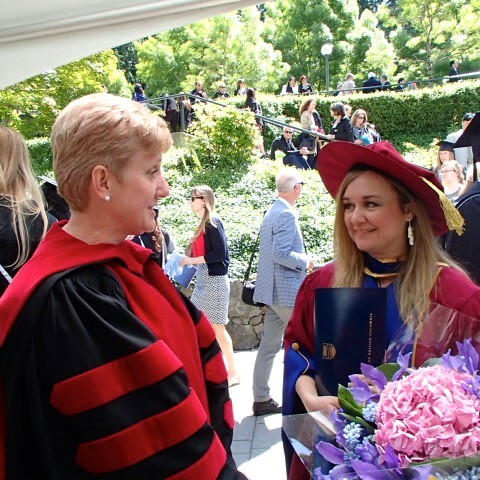 It’s hard to believe that just 28 months ago3, me and 50 other brave souls embarked on the intense and life changing journey that is the part-time MBA program at UBC. Taking an program like this – super intense in both the amount and type of work – while also holding down full-time jobs4 takes a special5 kind of person. I knew I was going to learn a lot in this program, as I had no background in business whatsoever, but when I look back on it, I’m still stunned by how much I learned. Entire fields that I knew nothing about – accounting, finance, economics, marketing, just to name a few – are now not only comprehensible to me, but also fascinating. This program has provided not just content, but also new skills that I apply every day in my work and personal life and it has expanded my worldview. And I feel very privileged to have traveled these past 28 months with the most fantastic group of people. I met people from all sorts of different sectors and backgrounds and learned as much from them as I did from my professors and textbooks. We worked hard together through countless classes and group meetings and Skype meetings and lunch meetings, through study groups and running simulated businesses and writing business plans and doing Friday case nights and the seemingly endless hours of capstone weekend. There were papers and exams and presentations and celebrations. There was a lot of laughter and some tears and some rants and all the things that life-long friendships are made of. The day of graduation, though they were calling for rain, actually turned out to be sunny and beautiful! One of the graduates from the full-time MBA cohort with whom I had a class6 and next to whom I sat at grad (due to us having surnames that are alphabetically similar) noted that this was because he’d worked his skills from the MBA – Master of the Black Arts. The convocation ceremony was nice, full of all the pomp and circumstance that a university convocation entails – the speeches were great and since I knew all of the part-time MBAs and a bunch of the full-timers (as I’d taken a couple of classes from the full-time program and some of them took some of our part-time classes) the seemingly endless parade of graduates crossing the stage was more interesting to me than my previous graduations, where I’d known far fewer of the people graduating. 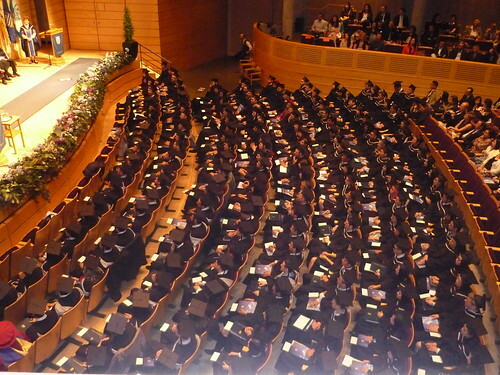 You can spot me in the fifth row by the fact that I’m in a pink robe instead of the black MBA robe – one of the perks of having the PhD7. Here is 4/5ths of D2NA, my group from school. One of our big project in the Core part of our program was to write a business plan and our company was D2NA, and our product was the Double Device (you may recall our mascot, Marty The Moose.)). 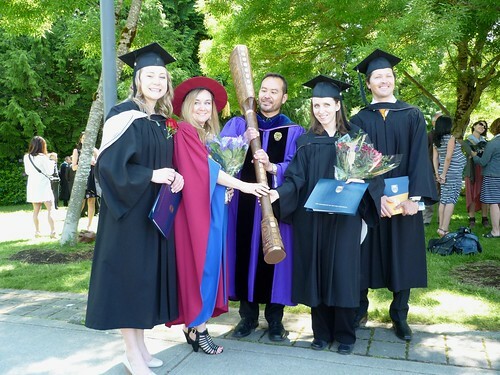 From left to right we have Bronwyn, me, the guy who holds the ceremonial university mace8 (not part of our group), Emily, and Tyler. Missing from the photo is Edmond, who wasn’t at the ceremony. And here’s a photo of me with Fran, the most helpful person EVER! When I first started my MBA, UBC had some difficulty in figuring out how to process my scholarship, as it’s a rare type of scholarship9 and they didn’t appear to have ever had a student with one of these before, so no one in the finance area could figure out how to deal with it. But Fran came to my rescue and after about a billion emails with Finance, she was able to get it sorted out for me so that I could get my scholarship money and thus be able to pay my tuition fees. She came up to me after the ceremony and introduced herself because, despite the aforementioned billion emails, we’d never actually met in person. Needless to say, I gave her the biggest hug! They were here for the whole week and we had many adventures, which will have to be the subject of another blog posting as this one is already getting way long! 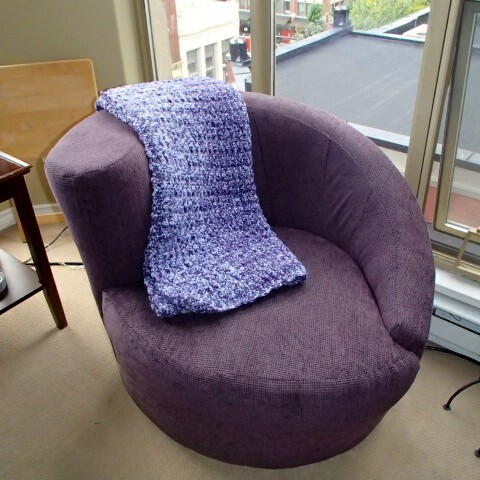 The picture does not do it justice – it’s an exquisite stitch that she used an the colours in it as so beautiful and it totally completes the chair! So that’s 18 letters after my name – and only 8 letters in my name! Even if you were to use my full legal name “Mary Elizabeth Snow” instead of just “Beth”, that’s only 17 letters in my name – still one fewer than all the ones I’ve earned the right to be put after my name! Image Credit: Specially thanks to my Aunt Eileen and my friend and classmate, Emily Graham, for the photos and video! What does the “CE” signify? You are amazing!!!!! Congratulations on your MBA! And the afghan is beautiful!